With recent headlines focused on politics, protests, international disputes, and a solar eclipse whose path of totality was within a day’s drive of Buckeye State residents, Ohio commercial property owners may have overlooked or forgotten that a statewide property tax reassessment is nearly complete. Ohio law stipulates that a comprehensive property reassessment is completed every six years. Auditors from across the State spend years evaluating a select list of criteria to determine a property’s value and, thus, its new tax rate. As Ohio business owners know, a lot can change in that time. For some, that means they can expect a tax hike. For others, it might mean a decrease. Lastly, some commercial property owners will see a negligible difference, regardless of the appraisal. This year’s property reassessment of more than 430,000 parcels (valued at $102.3 billion) will be a bit different. In addition to auditors completing their physical reviews, the State is also getting a boost from technology. 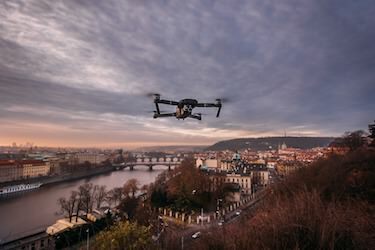 Thanks to the passage of a new law, for the first time, the State’s property reassessments will be based on drone footage, taken from about 400 feet in the air. While this will help expedite the process, the lack of on-the-ground property inspection is leaving some Ohio residents nervous. What guarantees will they have that their commercial property has been assessed fairly and accurately? And, how can property owners potentially challenge new property values? The first wave of valuations is being delivered throughout the month of August; members of the public will have their opportunity to disagree with their property’s assessed value and offer counter documentation. For Franklin County, the county housing Columbus, Ohio and its suburbs, Informal Value Review sessions will run from September 5 to September 28. Dates, times, and locations for those meetings can be found on the Franklin County Auditor’s website (franklincountyauditor.com). Before you decide to attend one of these sessions, the Auditor’s Office requires commercial property owners to provide an appraisal from a certified real estate appraiser or appraisal management company. Commercial property owners are not mandated to attend one of the Informal Value Review sessions; they may, instead, file a formal complaint with the Board of Revision (BOR). Owners should be aware that they have a small window of opportunity to file a complaint. After receiving the formal assessment by the County on or before November 8, 2017, the complaint must be filed with the Auditor’s Office between December 1, 2017 and March 31, 2018. Whichever way you decide to proceed, a formal commercial property appraisal is a key factor for winning your case. As briefly stated above, many of the counties in Ohio, like Franklin County, have a robust system in place to allow timely and relevant feedback from residents who disagree with their assessment. But, The Robert Weiler Company, a full-service commercial real estate and appraisal management company with almost 80 years in the industry, is also ready to offer its expert assistance. Armed with a professional, private review of your commercial property’s worth will help ensure the most accurate valuation and subsequent tax rate. The process begins with a formal commercial property appraisal of both a property’s interior and exterior with a site visit that takes approximately one hour in length. Our commercial property appraisers will also determine the condition of the land and any improvements (not just a drone fly-by), and then compare our findings to local neighborhood data. The Robert Weiler Company is most often approached by lawyers representing their clients; however, we are also contacted directly by property owners to perform these types of commercial appraisals. If a lawyer is contacting us, a Board of Revision (BOR) complaint has likely been filed, which tells us the year and location of the property being contested. Other times, the case may have already gone to the BOR and is being appealed, and they now want a formal appraisal to support their case at the Ohio Board of Tax Appeals (BTA). Our work includes a site visit, as well as the analysis, report, and one expert witness testimony at a BOR or BTA hearing. Additional testimony can be supplied, but it is rarely necessary. If a property owner is contacting us directly or the complaint has not already been filed, we will perform a brief preliminary analysis; this will determine whether we can help someone by executing such an appraisal. We will not charge someone nor prepare an appraisal if we believe that the assessment provided by the State was accurate. So, whether it’s apartment buildings and condominiums, office buildings, shopping centers, industrial sites, or land for sale, our CRE firm is fully equipped to take on any commercial property appraisal assignment. The basics of a commercial real estate appraisal are very similar, no matter what type of services you seek. Think of it as a science experiment, where the first step is “identifying the problem.” An appraisal may include determining the intended use of the property, relevant characteristics of it, and assignment conditions. The analysis and subsequent report includes market area data (general characteristics of the area/neighborhood) and comparable property data (sales, listings, offerings, vacancies, etc.). The analysis also evaluates four factors: scarcity, desire, utility, and effective purchasing power. Afterwards, the appraiser estimates the value and creates a commercial appraisal report that can take a few days or up to several weeks to generate. Cost approach: This technique equates the property value to the cost of constructing a replica. The cost approach also considers depreciation, thus, assuming a fair market value for the commercial property. Sales comparison/market approach: This method speculates that an investor will pay only what similar properties have sold for. Important characteristics may include location, size, condition, floor plan, and the surrounding area. Many in the commercial real estate appraisal industry believe this is a more accurate approach because the current market value is considered. Income capitalization approach: This tactic involves a rationalization of the income that a property may generate over time. Appraisers often use this method for properties, such as shopping centers, office buildings, and large apartment buildings, which have a strong earning ability. To determine a final estimate, the property appraiser must consider the value that results from one of these three types of commercial appraisals. The methods that are found to be the most reliable and applicable will be significant in determining the final estimate. Finally, we would be remiss if we didn’t give the State of Ohio the credit it’s due. Property reassessment – with or without drone assistance – is a major undertaking. Contrary to common myths, the State is not doing this in an arbitrary manner just to increase tax revenue. It’s easy to overlook or forget that a significant property tax reassessment is underway, especially as the summer comes to an end and we gear up for the subsequent back-to-school and holiday seasons. Don’t be eclipsed by this important property reassessment opportunity; you only have until March 31, 2018 to file your complaint. Contact The Robert Weiler Company today at 614-221-4286 to best protect your commercial property values and its reassessed tax rate.